A recent run in with Meagan* from my second grade class in my hometown, Kailua, Oahu, Hawaii, shared with me this blast from the past. Something about this caught my eye immediately. (I’m the fourth one in from the right, bottom row). For one my feet are encapsulated in little black mary-janes, and white scalloped edge socks (I remember those clearly, as they were my favorite to wear). I’m sporting a hand-smocked dress my grandparents acquired in the Philippines. And most curious, my hands are clasped together proud, and not at all shy. Maybe that’s just the pre-teen confident girl. Things no doubt change in adolescence. All that confidence I had shattered, then I had to build it back up in my late teens in college. I believe we are who are from the get go. And perhaps by age 8 we know who we are, and where we stand. I was very particular about what I would show up to school in, even making me late to class on numerous occasions. I barely remember my friends, who did I play with at recess? But I do remember my outfits, and loved all my dresses! Am I really that different now? While we can change our behavior if we really try, those roots are always there. I’m still that confident, poised, charming girl in the front row. Very aware of that my outward image matters, as much then as I do now. 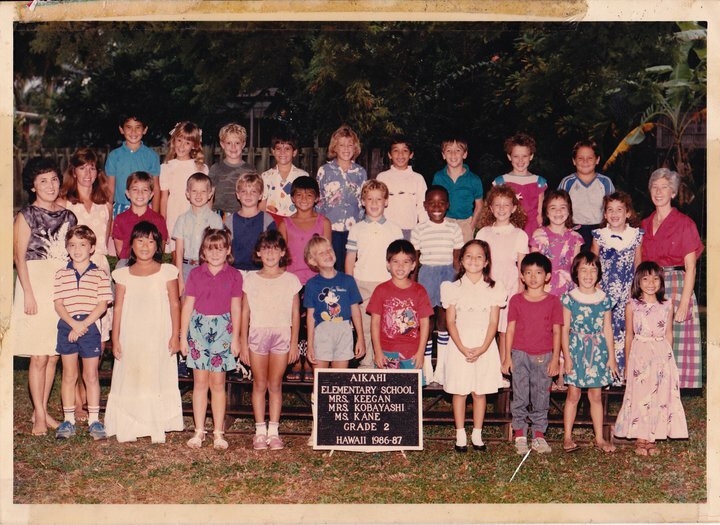 *Meagan is in the back row, second from left with bow-tied pigtails. This entry was posted in styling on February 15, 2013 by pualana. Amazing to be interesting after years! Most people wouldn’t think so clearly!